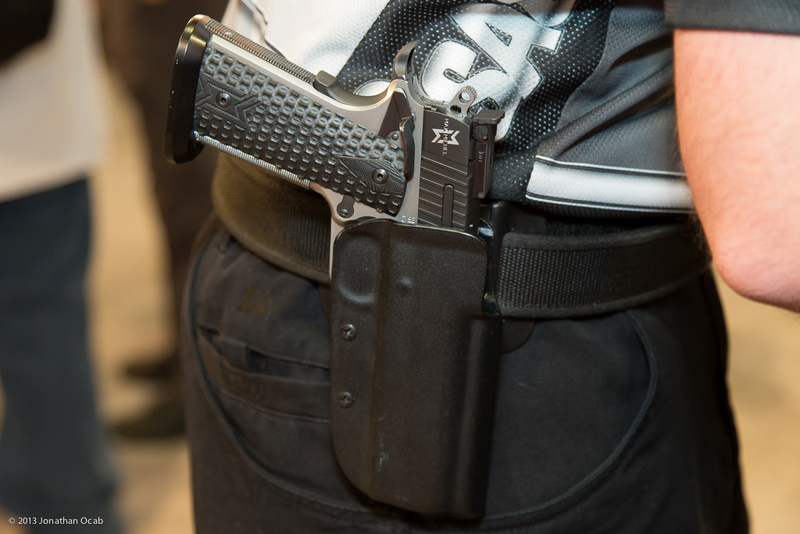 In my previous two posts on the 2013 SHOT Show (Part 1 and Part 2), I profiled the few new product highlights that I noticed at this year’s show. This last post is basically my general thoughts about SHOT Show 2013. I will just come out and say that this year’s show was not very exciting. Don’t get me wrong. 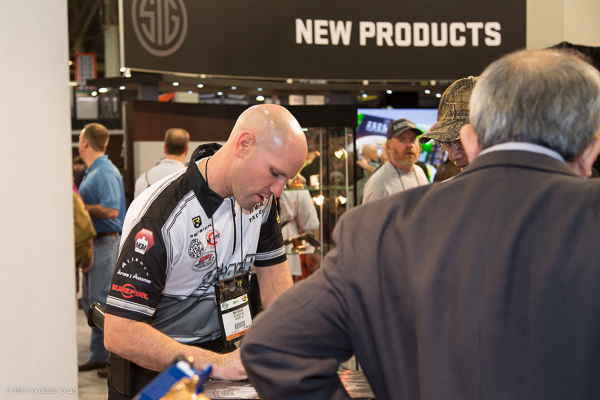 SHOT Show is Heaven on Earth for any firearms enthusiast that wants to see everything under the sun in the firearms industry. But there just wasn’t much new to report on and I think this is beginning to reflect the nature of industry shows in general. Industry shows in other fields (e.g. computers, consumer electronics, etc) have become less prevalent as a stage for launching new products. One example is Apple, who doesn’t even go to MacWorld anymore; a trade show specifically for Apple Computer users. Given that a company can launch a new product and news can spread like wildfire not only through traditional online media outlets, but also social media and Internet forums, SHOT Show becomes even less important with regards to timing of product launches. On the other hand, there is also the thought that the decline in new product at this year’s show could be a signal of the industry as a whole. Has the firearms industry come up with all that there is to be made at this juncture in firearms technology? One could argue that the Glock 30S, which is a Glock 36 slide on a Glock 30SF frame, that there really isn’t anywhere else for a company like Glock to go. I feel that we’re going to see a slow down in actual new firearms until we come upon an evolution in firearms design. Even a politically forced evolution like operator specific firearms (e.g. fingerprint recognition). This year’s show also just happened to be in the wake of the new gun control campaigning, and President Obama’s speech on gun control initiatives just happened to take place on day 2 of the 2013 SHOT Show. 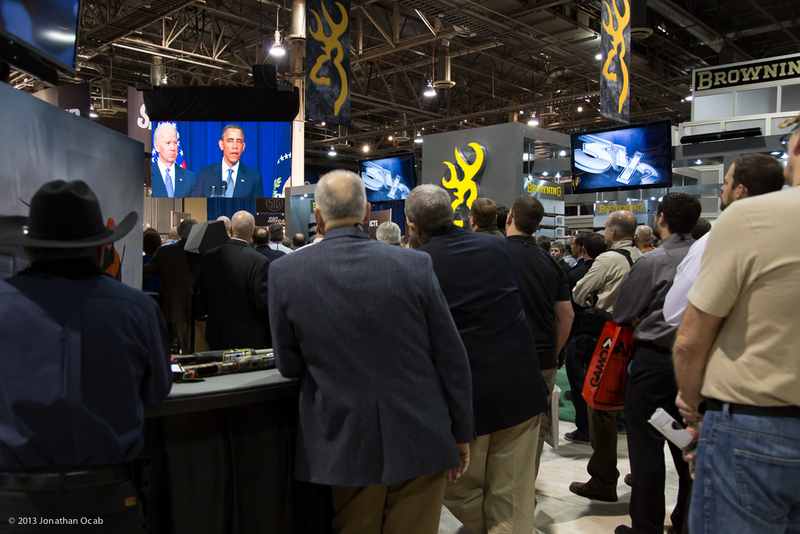 There surprisingly wasn’t much talk about gun control at the SHOT Show. Right now manufacturers can’t make guns fast enough. The panic buying is reaching incredible heights. So from a manufacturer standpoint, business is good. But what I wasn’t able to gather any real information on is the agility of manufacturers in reaction to possible new restrictions on civilian sales. Granted, it’s hard for any representative to give me an official on the record statement about the agility of their company with regards to adapting to a new gun control law, especially when you can’t predict the future. But given the fact that New York just recently passed a seven (7) round magazine capacity limitation, the firearms manufacturers need to be planning for the worst. That said, there was some interesting security at this year’s SHOT Show. The visual presence of private security was increased (from what I could tell) from prior years. The amount of canine units (private and local law enforcement) was also up from prior years. 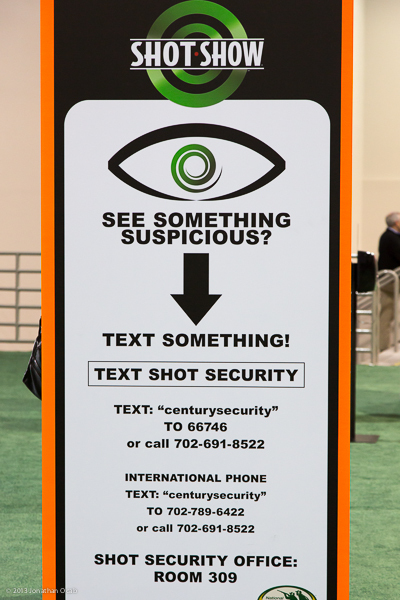 Then there were signs all over the Sands Expo asking people to send in tips on any suspicious activities seen at the show. I’m curious as to the change in security. I didn’t hear about any threats to the SHOT Show, but perhaps they were concerned about protestors and what not. 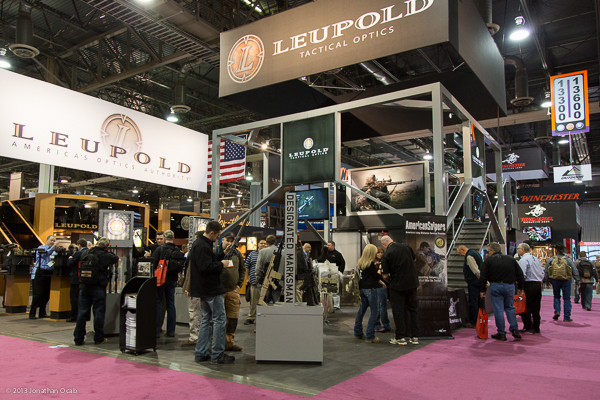 All in all, it was standard fare at the 2013 SHOT Show. The manufacturers were all in pretty much the same booth locations as last year. Lots of exotic guns on display. The usual round of shooting celebrities. Presentations throughout each day. FNH M3M. 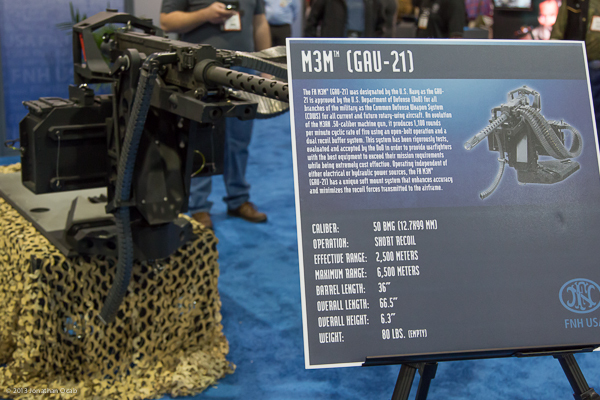 Helicopter deployed version of the M2 Browning. H&K Grenade Machine Gun. 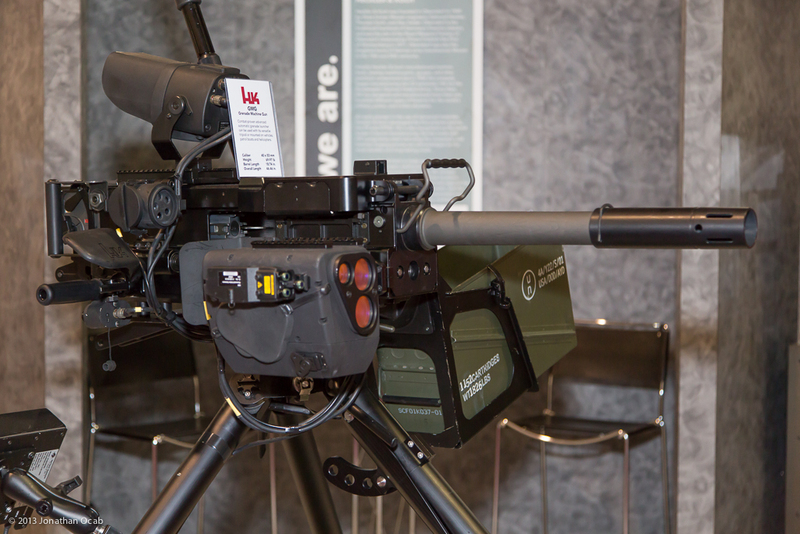 Basically H&K’s implementation of the US Mk 19 automatic 40mm grenade launcher. Bobby McGee, shooter for Team Safariland, giving a presentation. 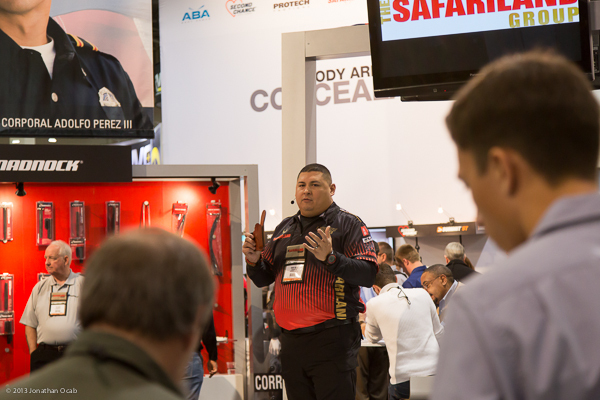 While I am somewhat disappointed with this year’s SHOT Show, it was still an entertaining few days and nights in Las Vegas.